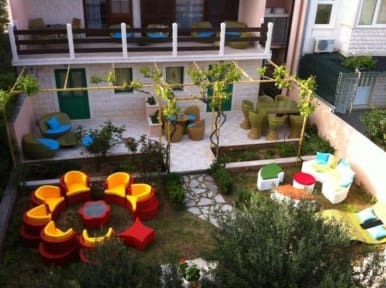 Hostel Kiki Bol is warm and friendly family owned Hostel that welcomes travelers from all over the world. Our hostel is brand new,fully redecorate with large open communal areas which are highly equipped and your hosts have big experience in tourist business. All guests can enjoy and relax during their stay in our big garden with comfortable sofas or on large terraces and living rooms, which are including Sat/TV and free WiFi. Each of our dorms are fully Air Conditioned and they have a large communal kitchen and dining area where guests can prepare themselves full meals or just a quick snack,s while in the garden we have large grill house where guests can have big barbecues with new friends from our Hostel. Reception desk is opened 24/7 for all additional information during your stay. Our guests can rent a scooter, car or small boat directly on reception desk and explore island Brac hidden places, also on our 18m long motor yacht for our guest we are organizing daily beach parties on famous beach Zlatni rat, and whole night parties during hot summer nights. Can’t recommed enough! Tonka, the host, is the most kind hearted lady and the absolute best host, she really made us feel at home at Hostel Kiki. Tonka allowed us to check in 2hrs early, sat us down and offered us a refreshment while she showed us a map of Bol and gave us advice to make the most of our stay. We had originally booked a dorm, but Tonka realised we were a couple and extreamly kindly upgraded us to a private room at no extra cost due to it being off peak season. Had a really lovely stay at hostel Kiki, was great to be a bit further from the town, just a 10 min walk up a nice street from the main part of Bol with beautiful views of the sea and surrounding area. Tonka and her husband are so friendly and welcoming, we felt really at home and could have happily stayed for longer. The beds are comfy and there is a cool communal area! Surprisingly nice and chill stay. We loved our stay here. Kiki is a very warm and welcoming person, she even made us fresh, chocolate stuffed donuts one morning!! The kitchen had everything you need to make a nice meal, the backyard is perfect for lounging and it’s a quick walk to amazing beaches. Had an amazing stay in hostel Kiki Tonka is the most wonderful lady!! So helpful and warm and friendly I really felt at home. Amazing outside area and really close to everything! Will definitely be returning!! Hostel Kiki is amazing! I booked a private room and the view from my balcony was breathtaking. There’s a big garden in the back yard if you want to hang out and meet people. It is located up a huge hill but then again, everything is! Our host, Tomka (I’m sure I’m spelling that wrong) was just lovely and so helpful and accommodating. I really didn’t want to leave. It felt like I was staying at a fancy hotel on a beautiful tropical island! When I return to Bol I will definitely stay here again!! Tonta made our stay warm and comfortable, as if we were staying with family. She always looked out for us and gave the best advice, even left a chocolate bar on our beds on the last day! Home away from home, with all the amenities you’d like, and comfortable beds. 5 min walk from the waterfront, and 2 mins from the supermarket. Would definitely return! Tonka is so wonderful, stay here! Great host, lovely garden and great location that is quiet but not more than a 20 minute walk to the furthest beach!